Originally posted: August 29, 2018 . Last modified: March 16, 2019 . One Pot Spaghetti is a recipe that honors Kim’s Grandmother. She prepared this a flavorful, spicy twist on an Italian favorite. It’s chock full of ground beef, green peppers, onions, tomatoes, and a pinch of heat. Tex-Mex or Mexican food, as it is more commonly known has been an American favorite for years. From enchiladas to tacos, we have developed a taste for the Mexican-American fusion of cheeses and spices. I’m not saying that’s a bad thing, it works. But, seriously, what’s the difference between a beef burrito and a beef taco? One is served on a fried corn tortilla, while the other in a large flour tortilla. With a few exceptions in condiments, they’re the same dish. For this reason, we have seen a rise in new Mexican fusion recipes like Mexican lasagna and Mexican spaghetti casserole. This dish is a prime example of Mexican-Italian fusion. Here we have all the flavors of a traditional Tex-Mex meal; like tomatoes, peppers, cheese, and onions. Kim’s Grandmother made this recipe for us for years, and I loved it! It was savory, spicy, and cheesy. What’s not to love, right? Moreover, she made it with love and that matter more to us than anything else. She passed away last year, and we thought a wonderful way to honor her memory was to share a variation of her beloved Mexican spaghetti. Just to be clear, when we originally published this recipe, it was named Mexican Spaghetti Casserole. Kim’s grandma also called it Mexican Spaghetti. We thought the photos needed an update, so we changed things up a bit. Instead of making the recipe in casserole form, it’s now made in one pot. No worries, though! This one pot spaghetti still has the same great flavor full of meat, peppers, onions, and cheese with a hint of heat. I’m going to explain how to make a basic spaghetti and then add a few extra touches. Even though this dish can be made in one pot, it’s not necessarily made at the same time. In fact, sometimes I actually make it in two pots if I’m in a hurry. In a large stock pot or Dutch oven, cook the pasta noodles according to the package directions. Cooking them to al dente is preferred, because they’re going to soak up additional liquid later in the process. Drain the pasta and set aside. In the same pot, or different pot if you’re using two, add the ground beef, onions, and green onions. Use a spatula or wooden spoon to break up the beef into small pieces, and cook until the meat is browned. If there is a lot of grease, drain it off. However, if a lean ground beef is used, there may not be enough grease to drain. Next add the tomatoes and their juices, tomato sauce, cooked noodles, water, and your choice of cayenne or red pepper flakes. Add salt and pepper to taste if desired. Give the pasta a good stir and allow the mixture to simmer and bubble for a few minutes. This will allow the pasta to soak up some of the liquid, soften a bit more, and absorb the flavor. At this point you’ve made a basic spaghetti. I’ll add some tips below about how to make this process even easier! Don’t let the pasta absorb all the liquid. It only needs to cook for a few minutes. Next, toss in the shredded cheese and stir to combine. Once the cheese has completely melted, it’s ready to serve. Can you cook the spaghetti in only tomato sauce? Yes, if you’d like to leave out some of all of the other ingredients and use only canned tomato sauce, it’s doable. Simply increase the amount of water used to compensate for the canned tomatoes. Can you used jarred pasta sauce instead of canned sauce? Yes, absolutely! If you’d like to substitute your favorite jarred or homemade pasta sauce in place of the canned tomatoes and canned tomato sauce, just make sure to substitute in equal amounts. For and foremost, use ingredients that you and your family enjoy! As always, our recipes are guidelines. This recipe can easily be switched with turkey or chicken. The onions and peppers can be omitted or extra vegetables, like mushrooms, can be added. The same goes for seasonings. Adjust as needed. Make this recipe super simple by using your favorite jarred sauce instead of the canned tomato products. Some great options would be a garden veggie variety, creamy tomato, meat sauce, or spicy marinara. See the section above for how to substitute jarred sauce for canned ingredients. Don’t overcook the noodles! I mentioned it above but wanted to mention it again. If the noodles get overcooked, they’ll turn to complete mush, and no one wants that. Al dente is the way to go with this one pot spaghetti dish! If you like this one pot spaghetti recipe, please leave us a comment and rate the recipe card. You can also find us on Facebook, Pinterest, Twitter and Instagram searching for Berly’s Kitchen! One Pot Spaghetti is a recipe that honors Kim's Grandmother. She prepared this a flavorful, spicy twist on an Italian favorite. It's chock full of ground beef, green peppers, onions, tomatoes, and a pinch of heat. First, precook the spaghetti noodles as per the instructions on the box. To avoid mushy noodles, we only cooked our spaghetti to al dente. Drain and set aside. Then, combine the ground beef, green peppers, and onions in a large saute pan, over medium-high heat, and let them cook until the meat is browned. Afterward, drain the excess fat, then add the pepper seasoning, canned tomatoes, tomato sauce, water, and cooked, drained spaghetti noodles. Let this mixture simmer for about 5-7 minutes. Stir in the shredded cheese until melted. Serve hot, and stir in leftovers in the refrigerator for up to 3 days. *The calorie count is an approximation based on the ingredients listed in the recipe. For this recipe, we used Pepper Jack Cheese and only one pound of ground beef. The original recipe called for cheddar cheese and two pounds of ground beef. Please let the dish cool for 10 minutes before serving. *See the post for tips about substitutions! Look at all that ooey gooey yummy cheese, that’s the best! 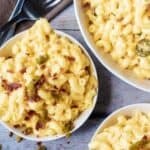 This dish sounds good, I have a similar dish and the family loves it. I miss my Nana’s Sopa and this casserole recipe would take it up several notches. Love the combination of flavors and textures. What a great tribute to Kim’s grandmother. Funny isn’t it how so many of us have memories of cooking with our elders. For me, it was my great grandmother’s silver dollar pancakes and brownies. Every time I make brownies I think of her. Mmmm, this looks tasty. I love all things spaghetti. I need to give this a try next week for dinner. That sounds so delicious..my mouth was watering just looking at the pictures and reading the recipe. Now this is the kind of meal that would disappear in seconds at my house. 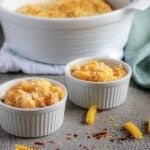 My family loves casserole especially with great flavors like this one. What a wonderful fusion of Mexican and Italian dishes! I’m sure families will love this. I’ll have to make it! This looks so much tastier than regular ol’ spaghetti. I’ll have to make this sometime next week. This looks so good! I love spaghetti and like making it in different ways. I will definitely be trying this out! Hello, Grandma’s Mexican Spaghetti Casserole looks so delicious! We don’t have a lot of good Tex-Mex food up north, so this will definitely be added to my “must-try” list. I’m sure if I sprinkle it with love and cheese like Kim’s grandma did, it will taste amazing! I’m sure she is very happy that her recipe is being shared and enjoyed by many. I’ve never heard of a spaghetti casserole before! What a neat and delicious recipe! Hi, Kita! Thank you. I rarely see it myself and am not sure where/how my grandmother got the recipe. Naturally, I read this while I am starving! And, what a wonderful tribute to your loved one! Can we use rice noodles, we are a gluten sensitive family? I like Tex-Mex and Italian but never thought to fuse them together. I can get down with this and I love the story behind it. This is very similar to a dish that I made last year, Taco Spaghetti. It’s one of the tastiest things I’ve made! My daughter’s boyfriend was over at dinner the night we had it, and he mentioned his grandmother made something like it (probably more like your recipe).